Flea Market Music bulletin board page offers an on-line bulletin board for ukulele players to communicate with each other about tuning ukuleles, buying and selling ukuleles, and other uke related questions. The Flea Market Music Bulletin Board is an open forum for ukulele players of all ages and abilities to discuss various ukulele topics of interest. 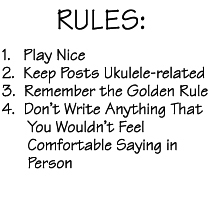 It is our hope that this will help to create a supportive community of uke enthusiasts. The opinions expressed here are not necessarily those of Flea Market Music. Please login to start a new thread. Please use the Moderator Contact Form to contact the Board Moderators. Hello my peeps! Long time no visit. I have begun to learn the basic chords but I have a long way to go to learn more advanced. Does anyone have some samples and advise for this newbie. (1) If concert ukes and tenor ukes are tuned the same, GCEA, how do they differ in the sound produced? I am Nicola Graham, and Happy owner of Ukulelebuzz. I have so many expert Musician. You can find Experts and Mine highly recommended Ukulele given below. I ran into 2 unusual,for me Kamaka's the other day.One was a lute,12 strings looked like a cedar top and koa bowl/ribs.A label that was hand typed dated 1970.